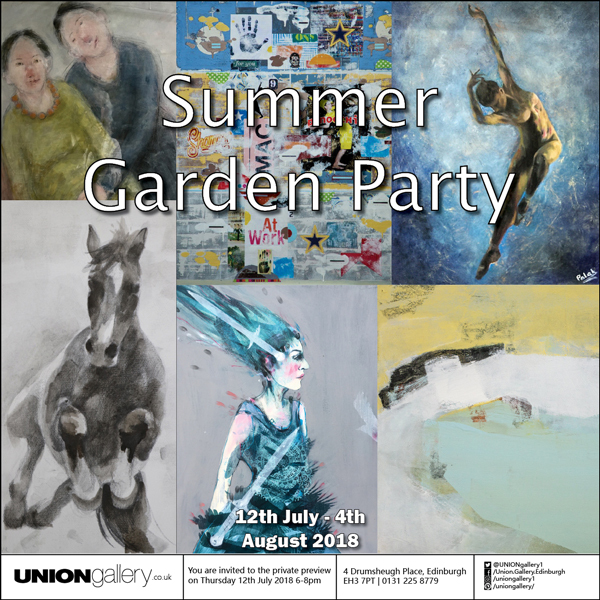 Yes, it’s all sunshine and roses for the Summer Garden Party at the Union Gallery, an exhibition of regular, favourite artists, including Patsy McArthur, James Newton Adams, Megan Chapman, Lucy Jones, Colin Brown and Sophie McKay Knight and Joyce Gunn Cairns. Expect a distinctively diverse showcase of amazing abstracts, fabulous flowers, posed portraits, lavish landscapes, architectural artwork, galloping horses, punchy Pop Art and comical Caricatures. Having been brought up in Arkansas, USA, Megan has recently returned to Edinburgh (where she now lives and works), from a trip back home to visit family in Winslow, (population 300), very much rural countryside of this Southern State. 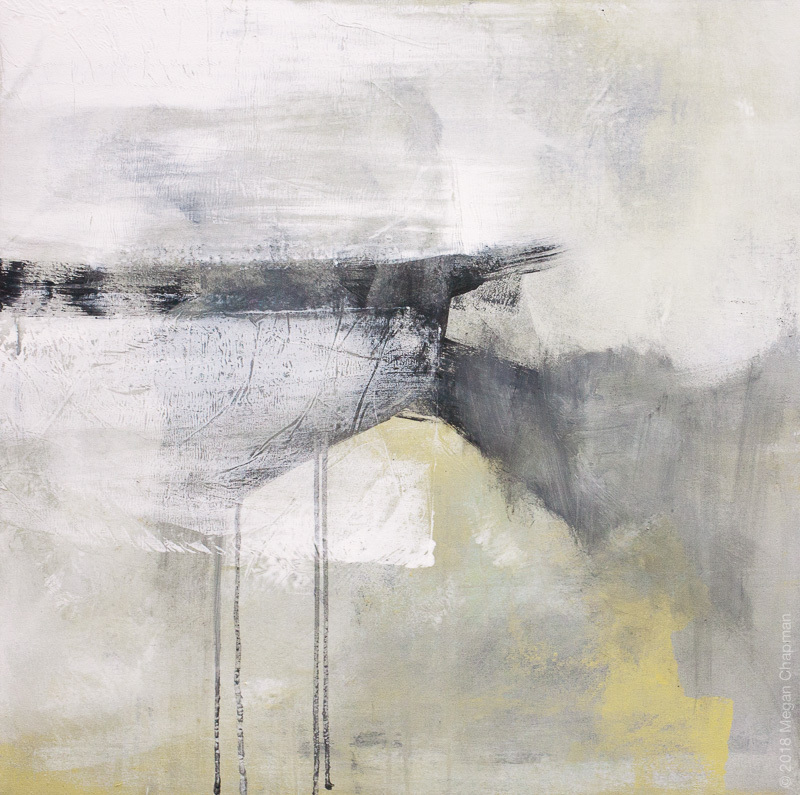 Using mixed media, her colour palette is soft and subdued with a smooth, smudged blend of grey, charcoal, teal, ochre, cream which is easy on the eye. ‘In the Shallows’ offers an inkling of a realistic place, perhaps a tranquil seashore and beach, but equally, it may reflect a more dreamlike image. Bold brush strokes create an essence of the outdoors, of air, water and sand. (See image in poster above). Certainly more meditative is ‘All That I Am,’ a darker, moody scene where thin spattered, streaks of paint drip like raindrops – or perhaps tears – down the canvas giving the fluidity of movement. 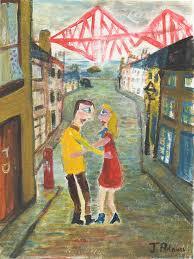 Understanding the artist’s raison d’etre to these works adds a personal dimension. 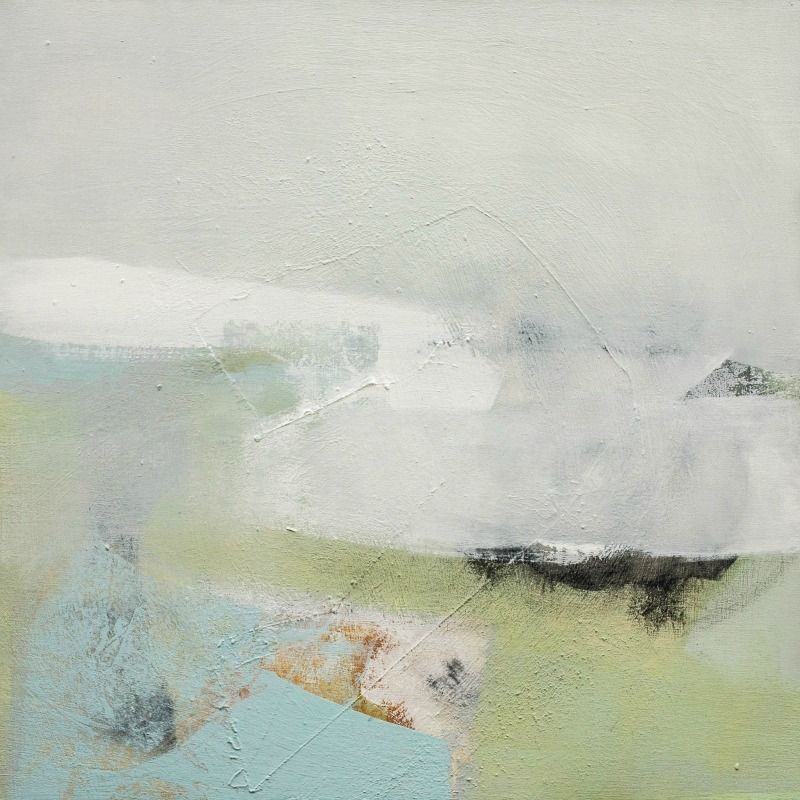 In ‘Return Home’ you can envisage the rich fertile earth of field and grassy meadows, a river and soft clouds on the horizon, as seen through distant memories, a distant past life. Her use of shimmering shades crafted with a cool, delicate touch is simply mesmerising in their imagination – fragile fragments of space, place and time, to capture the precious, elusive landscapes of the mind. 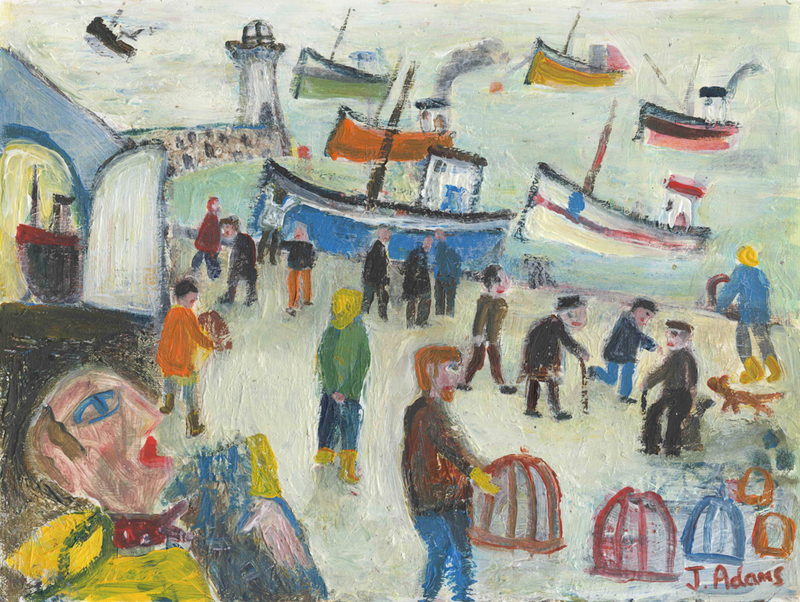 With colourful boats and lobster pots, “Wellies and Creels” is reminiscent of a children’s story book as well as clearly portraying the culture and heritage of small town life around a fishing harbour. 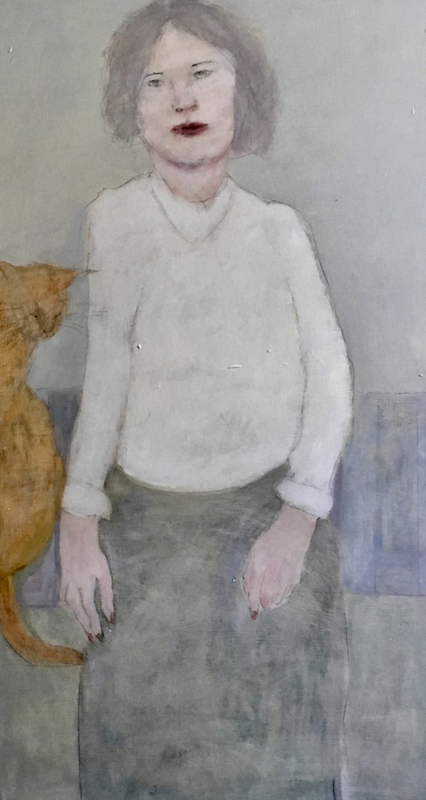 For those who know and love the rather eccentric portraits of women by the late Pat Douthwaite, a similar figurative style is employed by Sophie McKay Knight with her wildly colourful and fashionable ladies. ‘The Queen of Swords’ (see poster above), and a Priestess show off their exuberance, passion and joie de vivre. ‘The Writer’ is a fascinating profile, with no pen or book in sight, simply a madcap Bohemian girl, her serious expression as as frozen focus on whatever she is observing with intent interest. 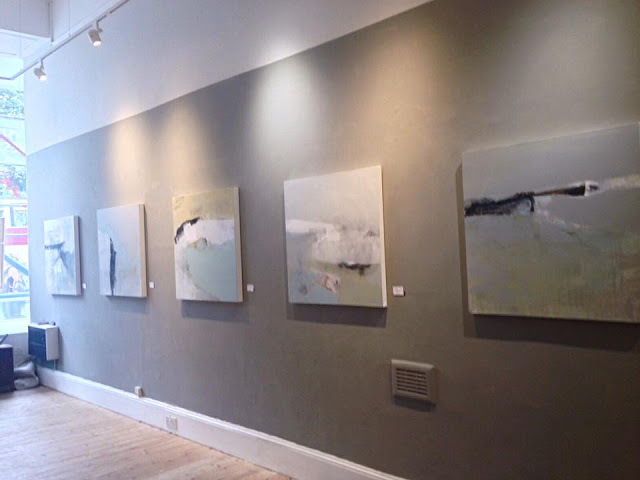 “Thematically, my work is concerned with the human figure, nature, science, transformation and magic. 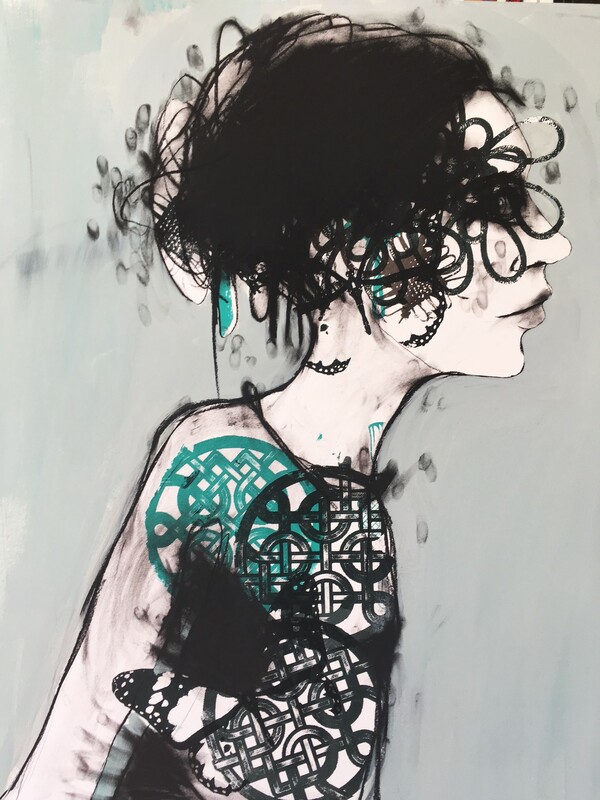 Although it mostly depicts people, many other things inform my imagery – often a scene I have witnessed, a story I have read, an historical character or event.” Sophie McKay Knight. And a Garden Party is not a complete without flowers. A vase of ‘Yellow Tulips’ by Joyce Gunn Cairns is an integral part of her trademark subtle sketches of domestic scenes where there are also cats of many colours who lurk and curl in peaceful comfort beside their doting Mistresses, apparently lost in quiet thought. 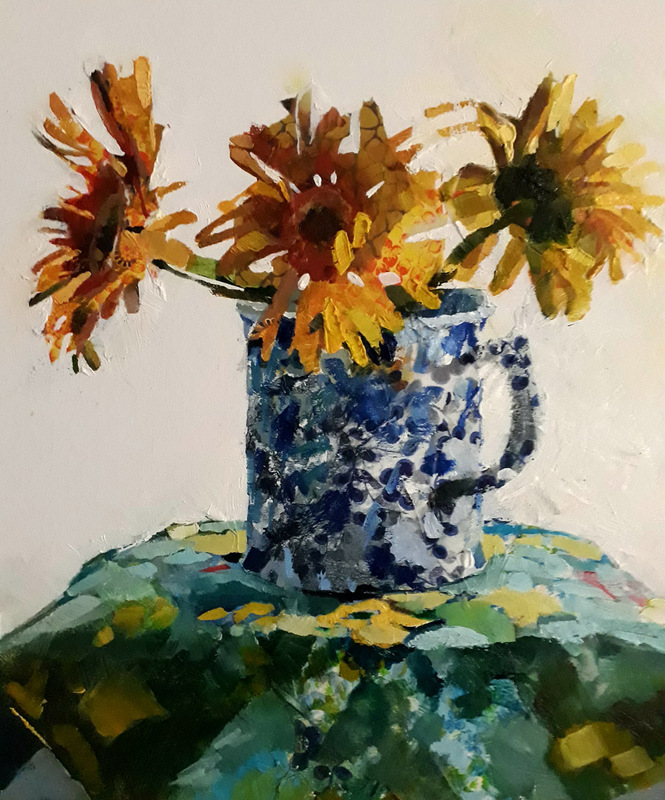 Aine Divine is also inspired by the natural world of colour and scent with her mixed bouquet of flower paintings, such as gaily patterned jug of ‘Sunflowers,’ as well as delightful ‘Oxi Daisies” and fragrant ‘Freesias’. This overview offers just a brief snapshot of this inspiring, insightful exhibition rather than illustrating the full picture. Take a stroll around this painterly Garden over the next couple of weeks to view the spirit of life and living, a marvellous, magical world as seen through the eyes and minds of these artists – and many others – across the spacious two floors of the Union Gallery. And view too a flourishing window box of blossoming flowers too within this sunny Summer in the City scene. Summer Garden Party – 12 July to 4 August, 2018. Open – Monday to Saturday, 10.30 – 5.30pm. Closed Sunday. 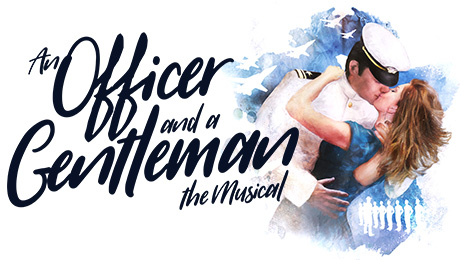 The title is an historic expression from the Royal Navy (1860) regarding a charge for “conduct unbecoming an Officer and a Gentleman.” The autobiographical tale was based on the experiences of Douglas Day Stewart who served in the military during the Vietnam War era. He attended the Officer Candidate School, at the Naval War College in Newport Rhode Island in 1962, a 12 week course under a tough drill instructor. As the recruits were from diverse social backgrounds, he roughed up his own character, put him on a motorcycle, gave him tattoos and martial arts skills to become Zack Mayo, who like Stewart himself, meets a local factory girl. He has long believed that such a Cinderella love story was perfect for a classic Musical and in collaboration with Sharleen Cooper Cohen, the narrative was adapted from screen to stage, with a soundtrack featuring a medley of 1980s hit songs, such as Material Girl, Heart of Glass, Alone, Toy Soldiers, Kids in America, The Final Countdown and Up Where We Belong. To take us on a time travel trip back thirty plus years, an opening screen shows a montage of famous faces of the era from President Reagan to Michael Jackson as well as vintage phones and computers. 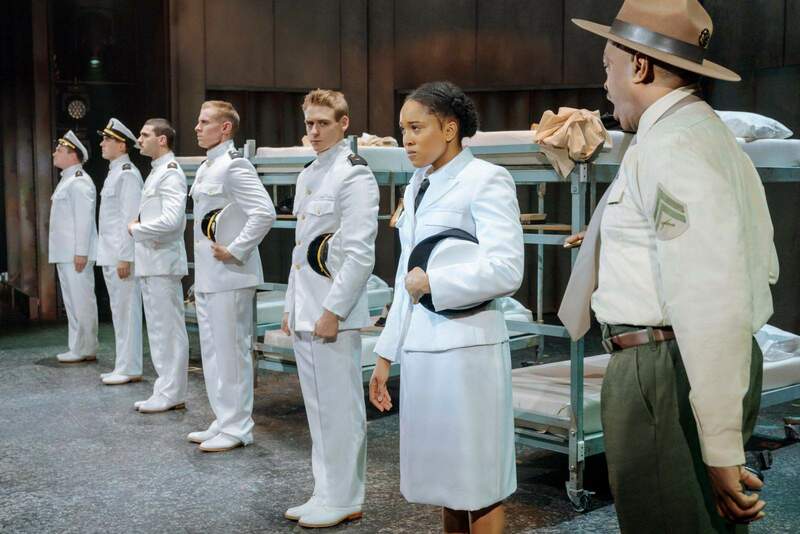 To a foot tapping rendition of “In the Navy Now,” the long haired, denim-clad recruits arrive, some already sullen, bolshy and bored as they line up to meet the fierce Drill Sergeant Foley. Zack is here with ambitious plans to improve his lot; brought up by his womanising sailor father, his dream is to be a pilot in the US Navy and break free from the past. We observe a realistic fitness bootcamp – the ensemble are serious athletes as well as fine singers and dancers – as Foley puts the wannabe officers through their paces with a strict routine. Zack hits it off with two classmates, Sid and the only female candidate Casey, who is desperate to keep up with the guys. The quick changing scenes are set around the industrial, steel rigged structure of a moveable staircase, lecture room, gymnasium, dormitory with a backdrop video of rolling waves of the sea which is most authentic. 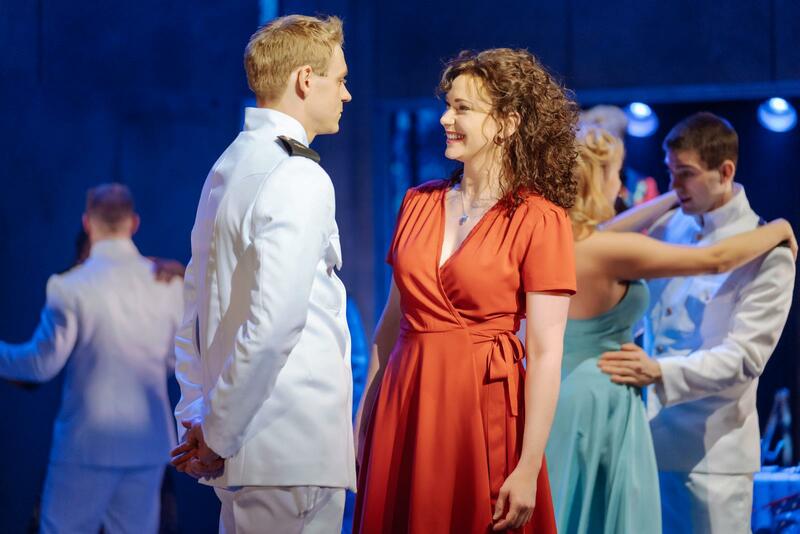 A realistic slice of working class labour is witnessed at The Pensacola Paper factory, where a troupe of hard headed, soft hearted women are keen to follow the tradition of generations of factory girls to try to woo a trainee officer into a relationship and then marriage to ensure a military wife-life, travelling the world. in comfort and style. Glammed up for a party at the Naval base, Factory girls Paula and Lynette are immediately snapped up by Zack and Sid for a formal dance, then head off to TJs Bar for drinks, where “Girls just wanna have fun” until the wee sma’ hours and beyond. The narrative follows their parallel romantic relationships alongside the gruelling training in an aircraft carrier simulator, exercises and trials, with drop outs and disciplinary action for failure. Ray Shell is exemplary in his portrayal as the brutal, bossy Sergeant Foley who suffers no fools gladly, as well as being a kindly, compassionate father figure. Taking centre stage are Jonny Fines as Mayo (nicknamed Mayonnaise), and Emma Williams as Paula who express a cool, charismatic chemistry as they slowly get to know each other from strangers to lovers, but each with a ton of emotional baggage from their respective dysfunctional family lives. 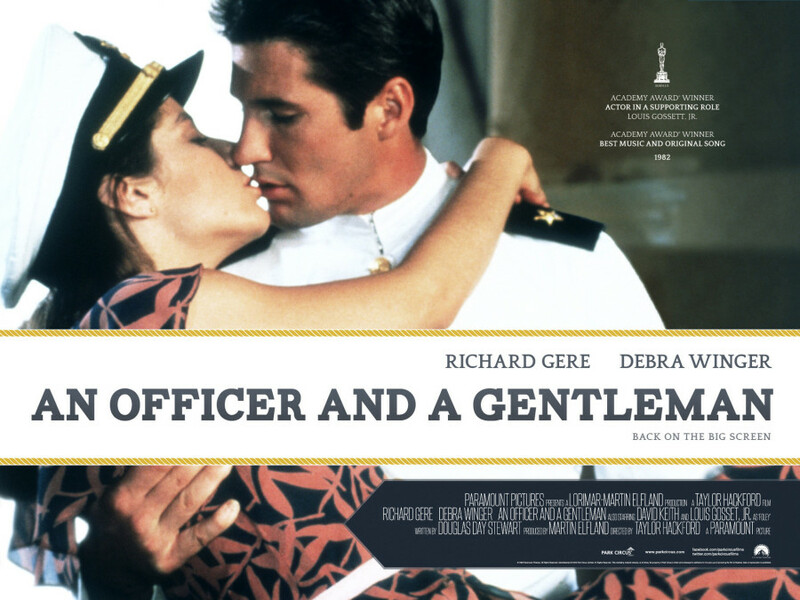 The final scene in the movie – regarded as one of the most romantic scenes – is faithfully replicated but unfortunately, it seems to be over in a second, almost lost on a crowded stage and more of an innocent brief encounter than the Gere – Winger moment of impulsive, electrifying, pure passion. The musical soundtrack of familiar lyrics has been shoe-horned into the plot, some songs slotting in more easily than others to carry the story seamlessly along. Expect a high standard of acting, choreography, music, production values, costumes, lighting, design and fast paced action. 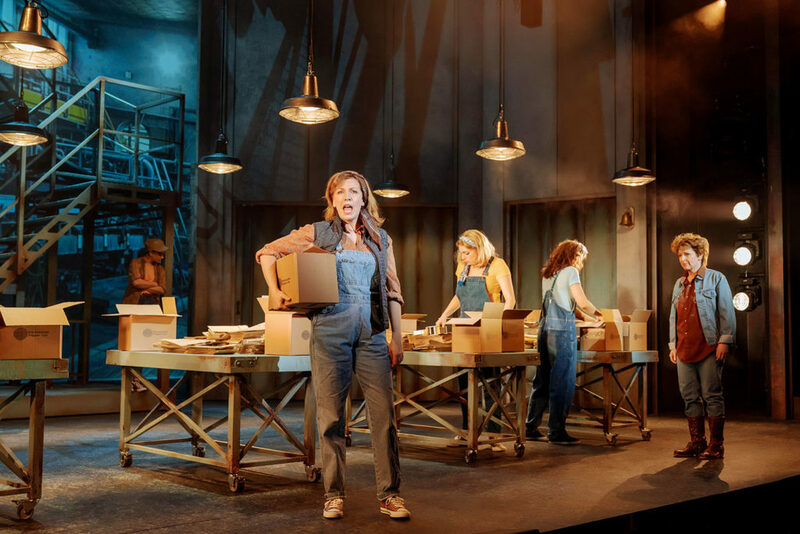 While this could be as cheesy as a Quattro Formaggi Pizza with an extra spoonful of parmesan, this light and frothy jukebox show is rich in dramatic tension and strong characterisation, captured with heartfelt empathy and true grit. Stop Press: Douglas Day Stewart has recently finished the screenplay for a sequel and sending it to Warner Brothers. It is described as a trailblazer, a story of female empowerment personified by Zack’s daughter who wants to be a jet pilot, but who knows her dark secrets.? The classic scene from the movie with Zack sweeping Paula off her feet.